​​​ ​McKINNEY – Independent Bank broke ground Jan. 17, 2018 on its corporate headquarters at the McKinney Corporate Center in Craig Ranch. The 150,000-sf, six-story headquarters, located at the southeast intersection on Henneman Way and Grand Ranch Pkwy. will be the city’s tallest building and allow space for Independent Bank’s anticipated growth​. 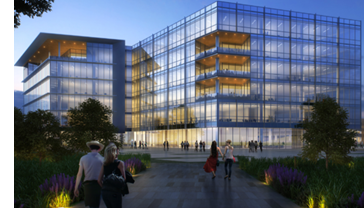 The $52 million headquarters will house between 1,100-1,300 employees.